Gisele Bundchen on the field at the World Cup in Brazil? Why not? Let’s get back to 2010 for a while. Four years ago Louis Vuitton made a special travel case for storing the World Cup trophy. I wrote about it in an article Louis Vuitton at the World Cup. The case was unveiled a few months before the World Cup and just before the start of the final match Fabio Cannavaro, the captain of Italian team that won the World Cup in 2006, brought the case with the cup on the field. Collaborations such as the one between FIFA and Louis Vuitton, will make football even more interesting to different segments of fans. And sometimes it’s more fun talking about fancy travel cases than watching the game. It will be very interesting to see if FIFA’s going to use such travel case in 4 years time. If so, which company will make it? My bet is on Louis Vuitton. Louis Vuitton of course continued its deal with FIFA and used its trophy case for the second time. During the closing ceremony and just before the start of the final match of the 2014 World Cup in Rio de Janerio supermodel Gisele Bundchen and Carles Puyol, retired Spanish football player and a member of 2010 World Cup winning team, brought Louis Vuitton case on the field. Gisele is a perfect choice: she’s probably the most famous Brazilian supermodel and also a Louis Vuitton brand ambassador. 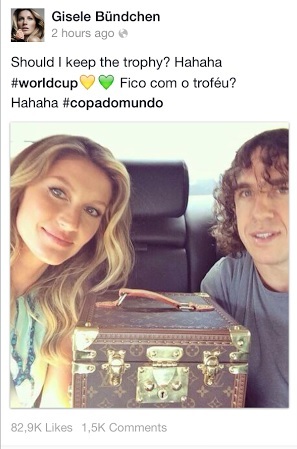 Gisele posted a photo of herself and Puyol with Louis Vuitton case on her Facebook page. I have to admit I like Louis Vuitton’s collaboration with FIFA. Can’t say it’s subtle, but at least it’s not too aggressive.